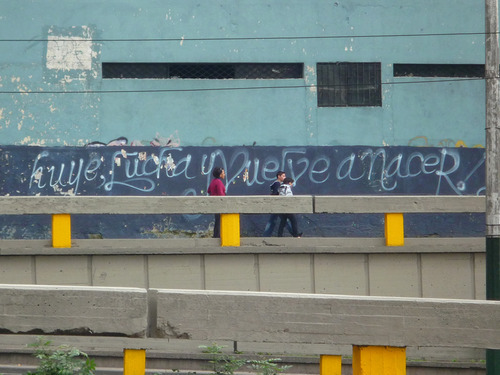 Editor's Note: This is the first in a 3-part series about graffiti and other urban art from various Latin American countries. Although its modern incarnation originated in United States three decades ago, graffiti art can be found in the urban areas of almost every country. By now, the drawings and messages sprayed on walls, murals, and other spaces have been widely covered by both citizen and traditional media. 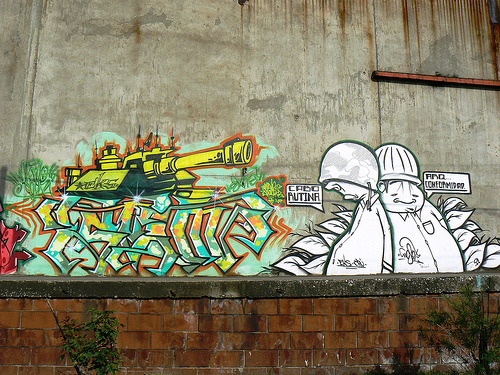 They are also slowly gaining recognition as a controversial art, along with the rise of other urban expressions like stencils, posters, stickers, and mixed techniques. In public spaces, street art (or urban art) represents the voice of the community, marginal groups, and young people that strive to be heard, often defying the notion of private property. Latin America is not an exception for this. Some of Latin American street art is distinct from what is created by the hip-hop movement, focusing on political messages and stories of struggle that speak directly to the viewer. Through the lens of bloggers, Flickr users and communities, and contributors on YouTube, we offer you an online tour of the art of the streets that communicate secrets and passions at every turn. 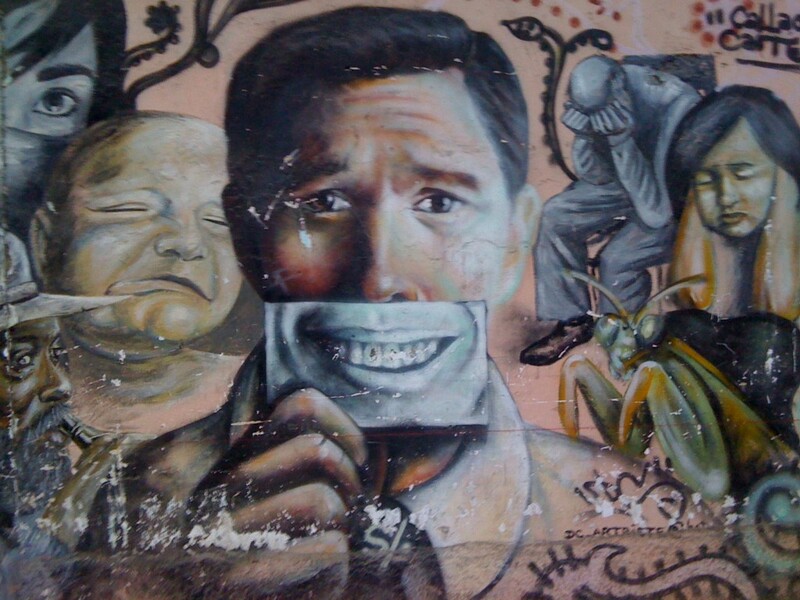 Street art in Peru needs to be reformed, because it has always been torn apart by terrorism, corruption, a faulty educational system, and overall party. With all of those issues, it is difficult to move forward in any direction. That is no way for this country to develop, and the art goes by the way of development. If it is not cultivated, then there cannot be any high expectations. For those who clearly know what graffiti is, and practices it, I hope that they are aware of the power of being on the streets. It must be handled with responsibility, and sometimes one must sacrifice and do what is best. This sometimes means to refrain from painting egocentrically and paint only what one wants, and what only one can understand. They must be strong-willed to represent what the community wants to see and needs know. To look for the way to make what everybody likes what you like, that is the hard part. I was on the bus not feeling well because of life and thinking that nobody could be having a rougher time than me. I looked up and saw this picture on a wall [es], I quickly thought that my problem was nothing compared to others who spend more time sunk in problems, than living in peace. Related work can be found on the groups of Flickr Peruvian graffiti and Peruvian street art. Actually I am not a big fan of graffiti, most of the times I don't even understand what they say because of the complex tracing used by most of the graffiti artists, but when the message goes clear and direct, then of course I do. Flickr groups for urban art of the cities of Cali and Bogotá share photos from almost 300 members altogether. “Writers” is how graffiti artists call themselves because of their use of quick signatures (called tags) and bombed letters (known as bombs). 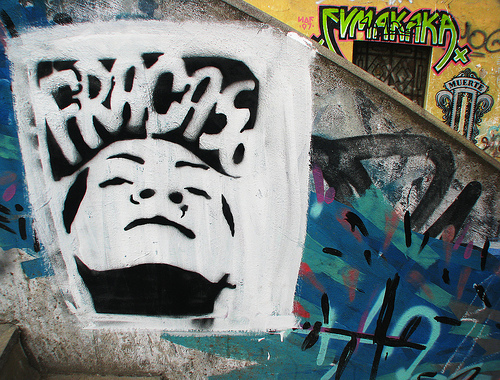 In the case of Ricardo (alias NEARsyx [es]), he is a grafitti writer, and also a blogger at Hemisferio Urbano [es] he shares events, profiles of other graffiti artists, gathers media coverage of the movement, and also sums up the feeling of his graffiti crews and the community. Sadly here, and I think in other places too, graffiti is commonly associated with gangs, a clear example of this is a recent documentary made by Noti7, a local news show, where the video was edited in a way that left the audience in confusion and holding the same idea that the graffiti is for vandals. In the documentary, some appeared that really do belong to the artistic movement, the bad thing is that the pictures of the [graffiti] pieces and the interviews they did were mixed with the images of the graffiti vandalism, something that left a bitter taste for us, who belong to the real community of graffiti. More images from the urban art of Guatemala can be found on Flickr in the Graffiti Guatemalteco group and Hemisferio urbano's account. Dear Issa, thank you very much for the article. I was mapping street art and graffiti in the South Caucasus. I launched a project http://www.street-language.com/ to collect different street messages. I’m open to any kind of collaboration! Please write me if you’re interested. Thank you, I will surely check your project. Great post and something I wish we had more of in the South Caucasus. Alexey, interesting about your project, although there’s not much in Armenia. However, you might be interested in the following. Now imprisoned blogging Azeri youth activist Adnan Hajizade on graffiti in Baku as well as a graffiti flash mob OL! organized. 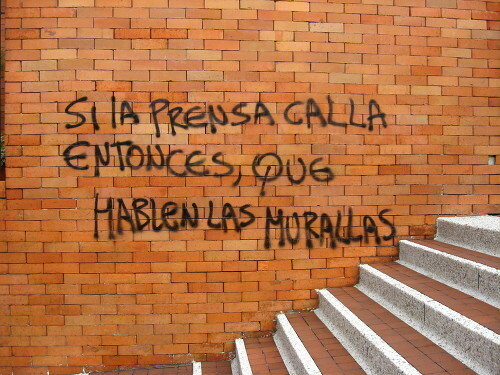 The graffiti are a cultural expression that is part of human communication, but the authorities do not see very well in Colombia because it stains the walls as well as that usually is against the current government. This is certainly Realizing the ideology is free expression. ¡Best regards and happy new year! Of course! It is difficult to imagine a system that cheerfully receives controversial and open criticism on the streets. We have to find our ways (as wild as they can be) to communicate what we need to communicate. Your article I found very stimulating to reflect on and respond to the subversive power of art when it comes out strongly in the street or your emplezamiento makes it perfect. The street is democracy itself, since it is the first public instance in which citizens are expressed (or should be able to) freely: all passersby can see these messages which are the graffiti complaint and thereby participate in citizenship conscious, engaged view the reality and active on political, social, economic, educational, … their respective countries. That is why I consider that the street art contributes enormously, both by the strength of his instrument, graffiti or “discourses in images”, for the chosen space to translate, at the creation of a collective civic consciousness essential to activate changes policies of any country in the world.